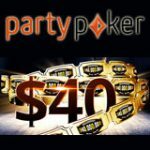 For a limited time players can signup and get the Party Poker Powerfest Bonus 2018 which includes $22 in tournament tickets with your first deposit. The new signup bonus consists of four $5.50 tournament tickets which can be claimed by making a first deposit of at least £/€/$10. 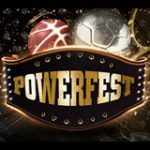 The tickets can be used to play tournaments of the same value including the upcoming Powerfest series which guarantees over $60 million in prize pools. 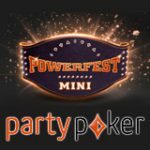 To claim the Party Poker Powerfest Bonus 2018, players are required to make a first deposit. Simply signup and deposit £/€/$10 or more and get $22 extra in tournament tickets. 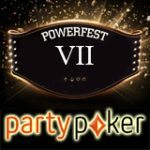 Use your tickets to play satellite tournaments to the Powerfest series where you can play for your seat to $60 million series on PartyPoker. After signing up and making a first deposit you receive the following on top of your deposited amount. 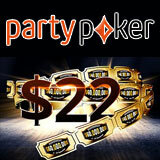 Players will receive their tickets within 48 hours of making their first deposit at PartyPoker. The tickets must be claimed within 14 days from the date of issue. After claiming the tickets players must use them within 7 days or they will expire. 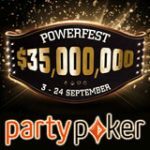 The Party Poker Powerfest takes place between 2nd to 23rd September, 2018 offering over $60 million in total guaranteed prize pools. The tournament series features buy-ins ranging from $1.10 up to $25.500, with the option to qualify by playing daily satellite tournaments. There are 670 tournaments on the schedule which runs for 3 weeks, satellite tournaments are already available in the lobby starting from just $0.01. There are three different stake level divisions: Low, Medium and high stakes. You'll also find a variety of poker tournaments not just NL holdem. The series also features twenty Championship Events with fifteen of them have prize pools of a million dollars or more. 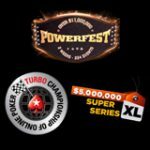 Become the next Powerfest champion start playing for your seat today in the daily satellites or buy-in directly on the day of the tournament.